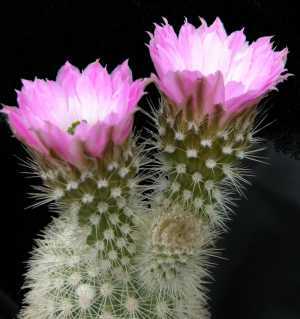 Cover picture: Our picture this issue is of a flowering plant of Echinocereus sciurus in the Ed’s collection. (You can click the picture for a better image.) The specific name records the plant’s resemblance to a squirrel’s tail. With only one head this is just a baby - it makes an attractive cluster in the wild and with care in cultivation. There is a picture of the same species in habitat on the back page to illustrate Ian’s article on the Echinocereus of Baja, California. Welcome to the Summer edition of Northants News. I write this as we are newly arrived home from Mexico. We spent three weeks driving the length of Baja California. With diversions it was nearly 3000 miles. This peninsular has few rare cacti but it is stacked with end to end cactus and succulent vistas. They were fabulous! Cardón (Pachycereus pringlei) tree cactus forests, Weird Boojums (Idria columnaris) like giant upturned carrots, everywhere - single, branched and impossibly contorted. We loved the fat elephant trees of Pachycormus and Bursera, by the Pacific coast, these were blasted by the wind and blown sand to perfect bonsai specimens. Best for me were the barrel cacti—miles of hillsides with a superb Ferocactus every few yards. The sun just shines off those fierce, red spines. True beauty. Some were in flower - what joy! Downside are the Mammillarias. They grew so densely in many places it was impossible to walk among them without damage. Hours and hours with identification books is totally frustrating. Despite having pictures of several with flowers. I was converting a slide presentation into digital the other day. Digital has several advantages, especially you can put the name of a plant actually on the screen with its picture. Good for the audience? Maybe. Definitely good for this speaker because he does not need to remember the name! One problem is that you have to get the name spelt correctly. So the weighty Crassulaceae volume of the IHSP hit the study table. Now was it suaveolens or sauveolens? This was a new and very different Sedum when it was described in the US journal in 1978. So different that it soon had a name change to Graptopetalum. The glaucous, blue-white rosettes were up to 3 inches (8 cm) and looked more like an Echeveria. Rare to start with, it was easy to propagate and soon washing-up bowls of the plant were on the show-bench. However there is a little trap here. Most of us kept the Sedum name on our labels but as a Graptopetalum the plant belonged to the Echeveria show subgroup, not in the Sedum subgroup. Judges were warned to watch out for this and the plant occurs in the Judges’ test in the wrong class every few years to tease us. Probably more often than it does on the actual show bench – there are far more show-worthy plants in both the Sedum and Echeveria subgroups. Knowing of the taxonomic hiccup, IHSP in hand, I turned straight to Graptopetalum but no suaveolens (or sauveolens). What on earth was it called now?. It seems the IHSP editors (botanical experts in particular genera) consider it to still be a Sedum. Since the IHSP is somewhat of the bible for the (other) succulent plants, will Sedum (Graptopetalum) suaveolens be back in the Sedum subgroup in the next edition of the ‘Guide to Shows’? One thing I clarified - the spelling is ‘suaveolens’. Wet days bring Google searches to the Ed’s study. Yes, I know there are a lot more important things to do, but this is fun! So I find myself looking through the 21,400,000 hits for the word ‘cactus’. This might take a while but the good news is you don’t look at them all, just those that look interesting. The first disappointment is that Northants News does not appear for a long time but I hope that searchers looking for a gentle read would be a lot more specific than just using the word ‘cactus’. For example; Northants News is the 19th (of 18,100) Google hit using the word ‘cactophile’ and most of those before are in French. My search was very educational; I learnt of a new Mammillaria ‘species’, M. paulii. Not the most exciting discovery to judge by its habitat photos, but I am sure that Ian will give it a home. On the same web site (www.mammillarias.net) I was astounded to see pictures of Mammillaria pectinifera with both yellow and mauve flowers and a real beauty with bicoloured blooms. The whole site has some super Mammillaria pictures and is a useful resource. Look for yourself. Finally I found a ‘cactus’ story so shocking that I have printed it in our magazine (below). Oh, and Mammillaria paulii? Bored with reviewing 21 million ‘cactus’ hits, I put the Mammillaria into a web search and found it is the sp nova Realejo, a species of the Dolichothele group with large yellow flowers described by Thomas Linzen in 2005. It differs from others in the group by having only radial spines, round fruits and the largest seeds (2mm plus!). So now you know. A 22-year-old Sheboygan man was charged today with felony, domestic abuse, substantial battery and disorderly conduct for allegedly striking his live-in girlfriend with a cactus Wednesday night in their apartment. The man allegedly attacked his girlfriend with a cactus plant while she was doing dishes in the apartment. Radzicki had been drinking before the attack, which was unprovoked, the girlfriend told police. The woman, who police said was covered in blood, had to have half-inch thorns from the cactus removed with a tweezers by medical staff. Thanks to the Sheboygan Press.